It was a beautiful day last Friday, and so the colleagues and I decided to have lunch out. We went to a nearby restaurant to climb the steep stairs upstairs onto the outdoor balcony under cover. 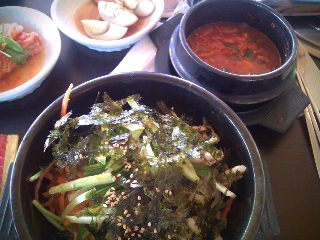 I ordered 돌솓 비빔밥 (Dolsot bibimbab), one of the traditional Korean dishes well known to foreigners. It's rice with thinly sliced veges such as cucumber and carrots, to be mixed together in the special hot black bowl. Healthy and yummy, which is probably why it's the number one most popular Korean dish amongst foreigners. Along with 삼겹살 (Samguyp sal), apparently.